Albert Edward Turton was born in Beeston in 1896, the second son of Herbert (born about 1871 in Beeston) and Annie his wife (born about 1869 in Ashton under Lyne, Lancashire). His brother Thomas William was three years older and they had two sisters, Hilda born in 1898 and Annie born in 1900. In 1901, the family, with Herbert working as a lace maker, was living at 50 Upper Regent Street, Beeston, Notts.2 The family later moved to 23 Middleton Street, Beeston3. Prior to joining the forces Albert worked at the General Post Office in Nottingham, where his name is on the War Memorial in the main Post Office on Queen Street, Nottingham. 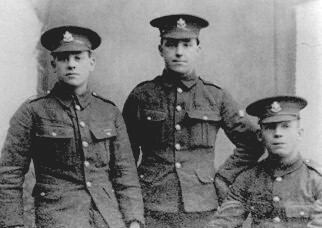 The photograph shows (left to right) three Beeston Old Boys Pals, Albert Tebbutt, Albert Edward Turton & Jack Lea. In August 1914, all three men marched, with their Beeston Boys Brigade Founder, Stephen Hetley Pearson,to the Derby Road, Nottingham, Drill Hall - then used as a Recruiting Centre - and enlisted together.4. Each of these three pals was to make the Supreme Sacrifice for King and Country. Jack Lea (seated) served with the 15th Battalion Sherwood Foresters; he survived until Thursday 28th March 1918 when he was killed during the German Spring Offensive. Albert Tebbutt served with the 9th Sherwoods until he was shot while the battalion were being relieved from the trenches on Monday 20th August 1917 in Belgium. In June 2007, Private Turton’s 1914/15 Star was offered for sale on EBay which Ray Smedley, the author of this piece, felt was very sad. Luckily one of his friends bought it for him as a present. The medal will eventually go to the Archives in Chilwell Depot. 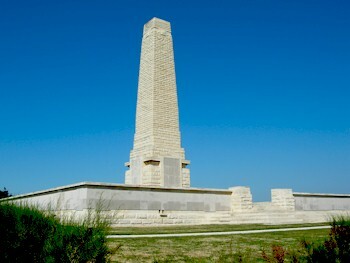 3This address is given in the Commonwealth War Graves Commission records. Albert Edward Turton's last address on the Absent Voters Register was 10 Clinton Street Beeston. 4Strangely, none of these three men are listed in the Boys Brigade Register although all are on the club photographs.